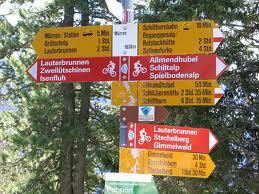 Each European country has their own style of promoting and waymarking their country trails. 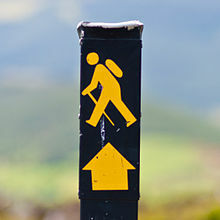 We have noticed that the Spanish for instance, are not great walkers themselves, but certainly in the Alpujarras they respect hikers from other countries and there is a really good set of routes to be had. Having said that, their waymarking leaves a lot to be desired and decent maps are not easily found before you go. 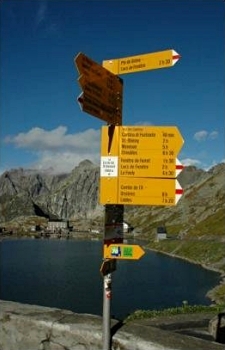 The Swiss on the other hand have uniform metal marker posts regularly placed on their walks with not only the grade of difficulty colour coded on the sign but how long it is likely to take you ...down to the last five minutes. Boring perhaps, but their wild flowers and scenery more than make up for it. SWITZERLAND - 11/10 precision engineered ~ too good, too plentiful. 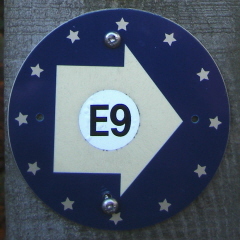 GERMANY - 8/10 Seems to be a sign whenever you need one telling you all you need. FRANCE - 7/10 Colour coded and numbered but not too much information. ITALY - 6/10 Like France really, just nice.. feels as though you have found your way instead of being instructed. IRELAND - 2/10 Often just a little walking man and an arrow. Hide & seek but entertaining ~ take a good map, and if that fails, drop into a pub and wait for a bus or taxi! You may well have a different point of view... tell us on twitter or post a comment on "Our Blog", we would love to start a discussion on this. You can follow where we have been in our films... click on the GoogleMaps icon or find a link at the bottom of our feature pages ( silver buttons).